Newsletter published by the the Village Theatre's manager, Myron Leslie Sparr. He sent his weekly newsletter to residents with descriptions of the upcoming movies, gossip about the stars, and details about planned improvements to the theaters. 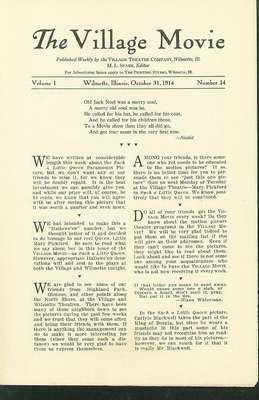 The Wilmette Public Library owns forty of these newsletters dating from 1 August 1914 to 29 May 1915. The Wilmette Historical Museum has additional bound issues from 1914-1917 which can be consulted at the museum.